Until recently the only mammal known to use electricity to sense prey were platypus, and now scientists have discovered that Guiana dolphin (Sotalia guianensis) uses electroreception as well. Guiana dolphin use electroreception in close range to sense the electric signals given off by its prey. They still use sound to hunt and locate like all toothed cetaceans. But echolocation does not work well in close-range, the signals can easily get confused during feeding frenzies. Since the majority of the Guiana dolphin feeding is done near the seafloor, where there is a lot of silt from the rivers of South America, it is likely the evolved this adaptation. Although there is a lot of controversy about keeping wild dolphins in captivity, it is because of this researchers were able to autopsy carcasses and find new discoveries. It was in doing so that scientists became curious about small depressions in the dolphin's rostrum (the snout). These depressions, or crypts, come from small whiskers that dolphins have during their fetal stages...but in this species it was more structured than others. Researchers began to train the captive species of Guiana dolphin to rest its head where they could examine it. They began sending electric signals to the dolphin - when the signal was received the dolphin was trained to swim and return for a reward. Then scientists put a plastic shield over the rostrum to block the crypts and found that the dolphin could not sense the electric signal. This proves that Guiana dolphin use the crypts in their rostrums as electroreceptors. The possibility of other marine mammals having this ability is likely, now that scientists know what to observe. Overfishing first occurred in the coastal areas of northern countries, then as fish populations decreased the high seas became exploited. Soon after, fishing vessels started turning their bows to the southern hemisphere to collect their catch. Top marine predators are more susceptible to overfishing because their life cycles are slow, many fish like bluefin tuna reaching sexual maturity at 9 years of age. Species like tuna have been seriously overexploited because of their high market value. In the part 40 years, the world's marine catch has increased more than four times. And just about 70% of all our oceans are targeted as fishing grounds, lacking proper laws because of their remoteness. Since the 1970s the world's fishing fleets have expanded to catch fish twice as quickly - as fish populations become sparser, boats must travel farther, and fish become more expensive and sought after. Fish is one of the most important parts of daily diets around the world, but in many places like Asia, fish are caught for high-end luxury hoteliers and restaurants, as wells as for oils and souvenirs while many people go malnourished and suffering. 80% of the world's commercial marine catch is consumed by just 20% of the world. There is something wrong with the entire system upon which we base our fishing industries. If fish populations continue to decrease, the world will be looking at a mass lay-offs in the fishing industry. Like the 20 000 Canadian fishermen in Newfoundland that lost their jobs overnight because the government had to completely shut down the industry to allow populations to compete. Commercial fishing does not just harvest their desired catch, but have massive amounts of by-catch that is wastefully thrown out. And bottom-trollers tear up the delicate ocean floor that takes thousands of years to grow. This means that one-quarter of the planet's biological diversity is in danger of extinction over the next 30 years! I was surprised when I stumbled upon disgruntled sailors and yachters who had visit The Bahamas only to be shooed away from their anchorage. A country, known for its remote islands, and relaxed culture, encourages the boating community to pass through its waters, except in one place. That place is Musha Cay, a small cluster in the Exumas, owned by David Copperfield. Boaters headed south to George Town, Great Exuma to speak with officials about the incidents at Musha Cay. Reporting that numbers of boaters have been told to leave the anchorages around Musha Cay. The official policy in The Bahamas is land is only owned up to the highest-high tide watermark, and the rest of the beaches and waters are considered public property. Anyone (who has entered the country properly) can anchor in all waters, waters can never be declared private. Although I took these incidents as potential “bad tourism,” it is apparent that the resort does not. Musha Cay was eventually issued a letter, recognizing a “motorized swim area,” and ship channel in front. The letter does not define the extent of the swim area, mention the use of markers and buoys, and nothing is charted. This motorized swim area is so unique because only one other exists in The Bahamas, off the Atlantis Resort, due to the location and safety factors concerning guests. But in the remote out islands, it is unheard of. Despite the fact Toronto, the most populous city in Canada, banned shark finning, there is still talk of illegal shark fin products being purchased outside of the Greater Toronto Area and distributed within. As I said in my previous article, “Toronto Bans Shark Fin Soup,” the issue will have to be brought to a federal forum to really tackle the entire country’s consumption of shark fin products. Banning the import of shark fin products to Canada entirely, will help raise awareness on this tragic and inhuman practice. If an entire country, like Canada were to contraband shark fin products, it would definitely raise political concern and pressure other Western-countries to criminalize the shark fin market. 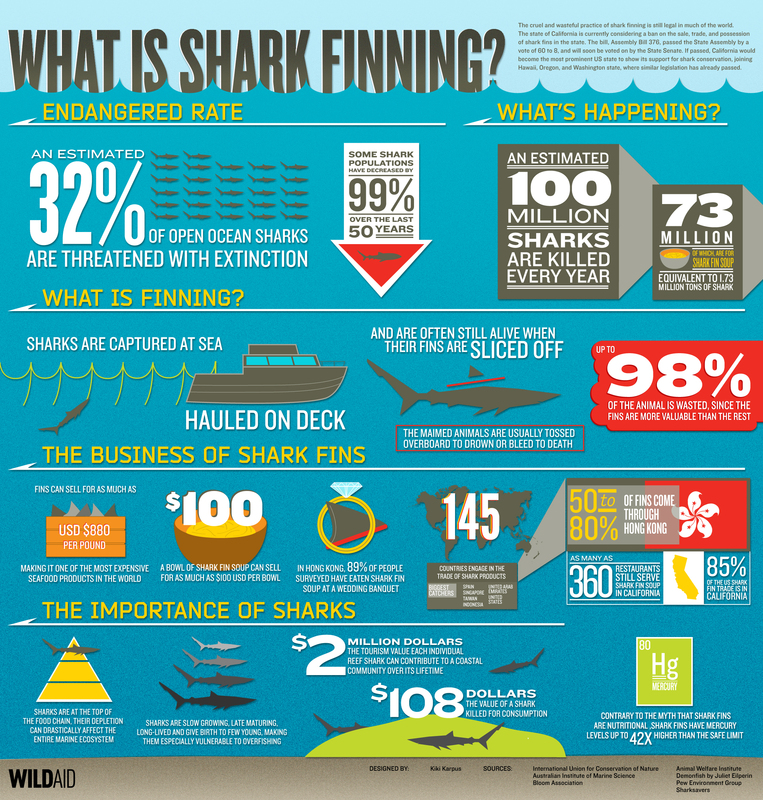 Although Canada has made shark finning illegal in its’ domestic waters, it still allows for the import of products. Specifically, Hong Kong and Japan are the largest consumers of shark fin soup, Canada being one of the smallest still imports 77 000 kilograms of shark fin products per annum. Any efforts made towards halting the global slaughtering of sharks could help increase populations. On average, between 26-73 million shark fins are traded every year, causing a steep decline in populations because of shark’s slow reproduction. Please make efforts to sign any petitions regarding the ban of shark finning. Loosing an apex predator that has survived unchallenged and unchanged for millennia will be a tragic loss with devastating repercussions. Some species of sharks will be extinct in less than a decade if nothing is done. Let’s not let the problem get so awful, that there will be no sharks for people even to greed over. By literally taking away the market, the cash flow and a reason to kill sharks will slow. Hopefully a plan that will inspire other countries to look towards conservation efforts regarding shark finning. If these were prides of endangered African lions being murdered for a body part, or elephants for ivory, the market for products would not have survived into the 21st century. Let’s start showing the ocean the same respect we show land – or sadly prove the mass majority of humans are really incapable of rational and responsible thought process, removing biases for selfishness. We, as an “evolved” species should have the insight and evolutional progress to make us aware of the devastation we are capable of, and the responsibility that comes with that. I would also like to apologize for the lack of blogs recently. I hope everyone has had a happy and healthy new year - and have a peaceful and prosperous 2012! I have been conducting research and interviews for a thesis paper that will be revealed here. I am currently in a quite corner of the Caribbean, unknown to tourists, discovering new information and enjoying every day on the water. I cannot disclose more details than that, but the daily blogs will continue, and please continue to give gettankedscuba.com your support! Thank you for your viewership and for reading these blogs I put so much effort into.